I'd like you to meet my granddaughter Kayla. 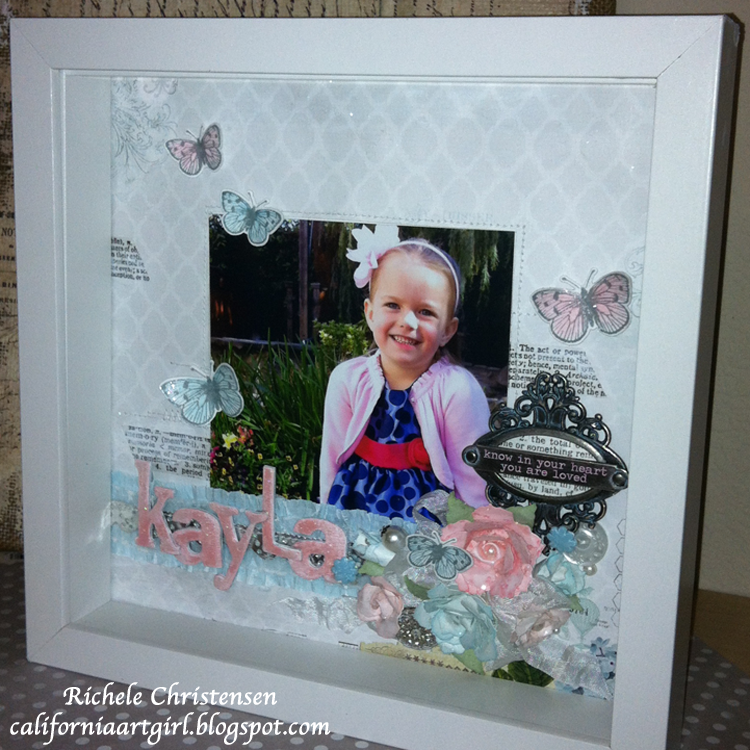 She is 4-1/2 years old and loves flowers and butterflies. She like snails too! ewe! You should have seen her smile when I showed the project to her. This is a shadow box frame that I found at Ikea, they come in black and white. Works great for dimensional flowers and things under the glass. The background paper is the new Paper Love line from My Minds Eye. Love this paper! I added some stitching, Tissue Tape and a little bit of stamping. I made all my components first. I started with the flowers. 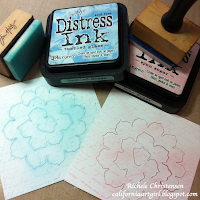 Using white card stock I stamped Hero Arts Old Letter Writing with Distress ink then I used an Ink Blending Tool to add a little color. 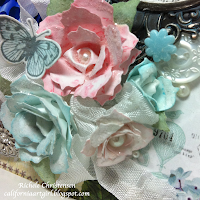 Tim Holtz has a wonderful Tattered Pine Cone Bigz die and you can make flowers with it. See Tim's video here on how to make these little jewels. Now the butterflies. This is a fabulous set by Sizzix and Hero Arts. 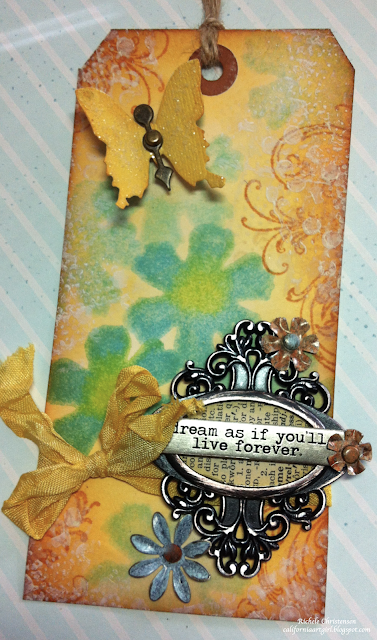 Stamp your image with Mementos London Fog ink and then just line up the die, die cut and your done! No more detail cutting. After stamping and die cutting I used my Distress Markers and Detail Water Brush to color the butterflies. 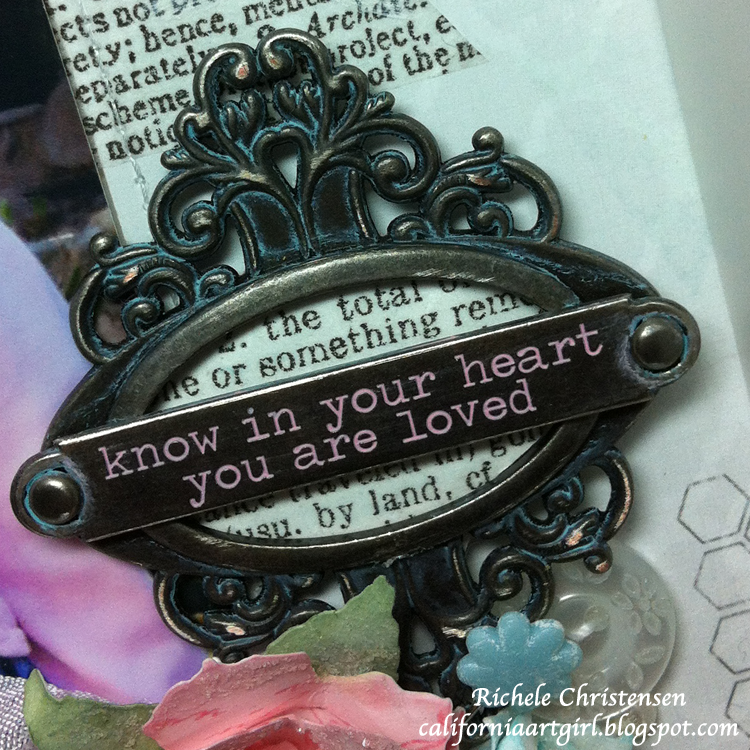 Add a little light blue Dabber Paint to the Ornate Plate and a little pink Dabber Paint to the Word Band. Add long fasteners and it ready to mount. If you like a vintage look you can sand it too! I wanted to use the new Tim Holtz Alterations Bigs XL alphabet Word Play die to cut out "Kayla". 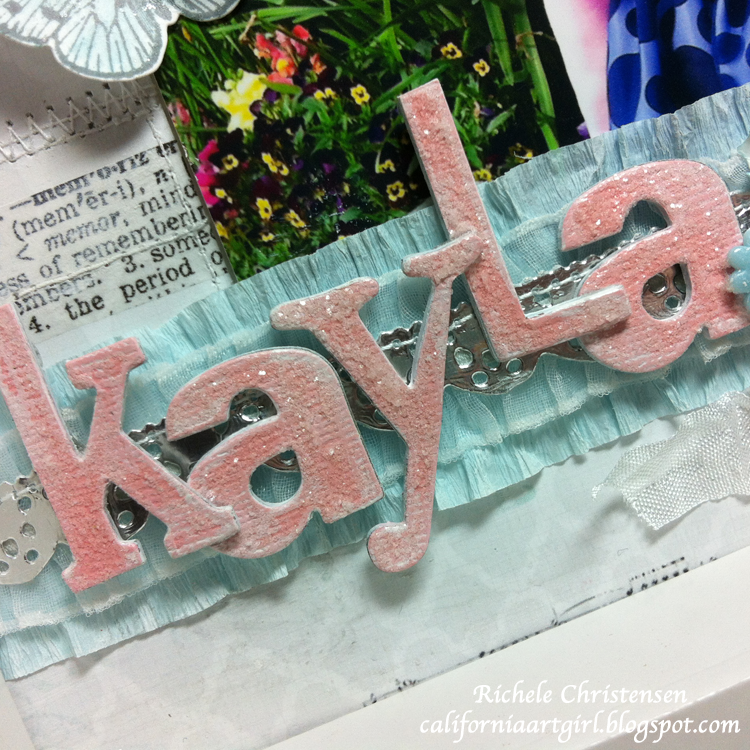 Using a collage stick I glued Distress Core'dinations card stock to a piece of Grunge board and die cut the letters out. Paint the sides and a little on the front of the letters with white Dabber Paint. The band behind the Kayla is a strip of blue crepe paper, trimmings ribbon and metal foil adhered to card stock then die cut using Tim Holtz Alterations Sizzlits Vintage Lace Decorative strip die. Once I had all my components and the background paper done I glued it all together with a hot glue gun. I added buttons from the Adornment pack, pearls from the Baubles collection, and lots of Rock Candy Distress Stickles for a little sugar coating. I can't wait to make a couple more with my two grandsons. Maybe black frames for them. Let the challenge begin!! 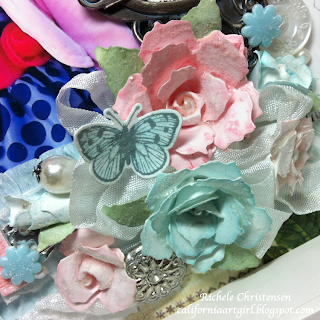 Over on the Studio L3 blog, Linda Ledbetter is famous for not only being such a sweet lady but also for the "Grungy Monday" and "Compendium Vol. 1" challenges. 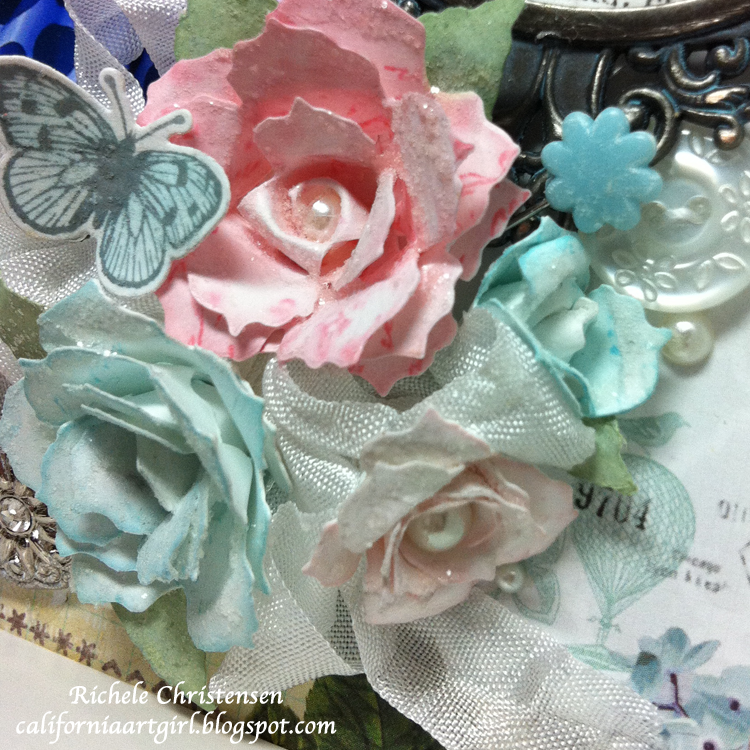 For this challenge she will be choosing a page/technique from the amazing Tim Holtz book Compendium of Curiosity, Vol. 2 every Friday and the event will be sponsored by Simon Says Stamps. 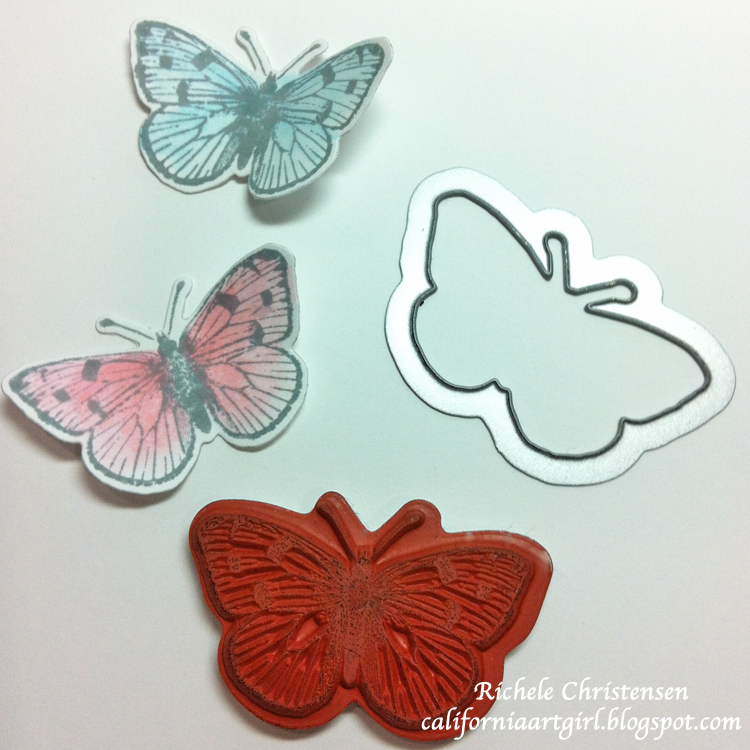 The first challenge is to make your own custom foam stamp, see page 66 in the book for detailed instructions. After making my foam stamp, I used the stamp to create a background of flowers on my tag using Distress Stain. 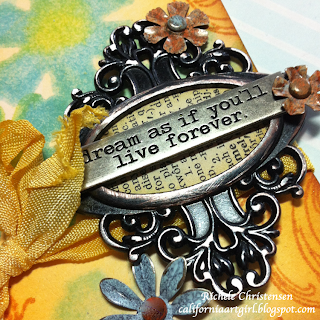 I also stamped the flourish using Wild Honey Distress Ink and then added some ink to the edges of my tag with an Ink Blending Tool. I colored the flowers with the new Vintaj Inks by Ranger to pull the colors in from the background. I really like how the Word Band fits perfect inside the oval Ornate Plate. I hope you checkout Linda's blog and join in on the challenge, it's going to be FUN! 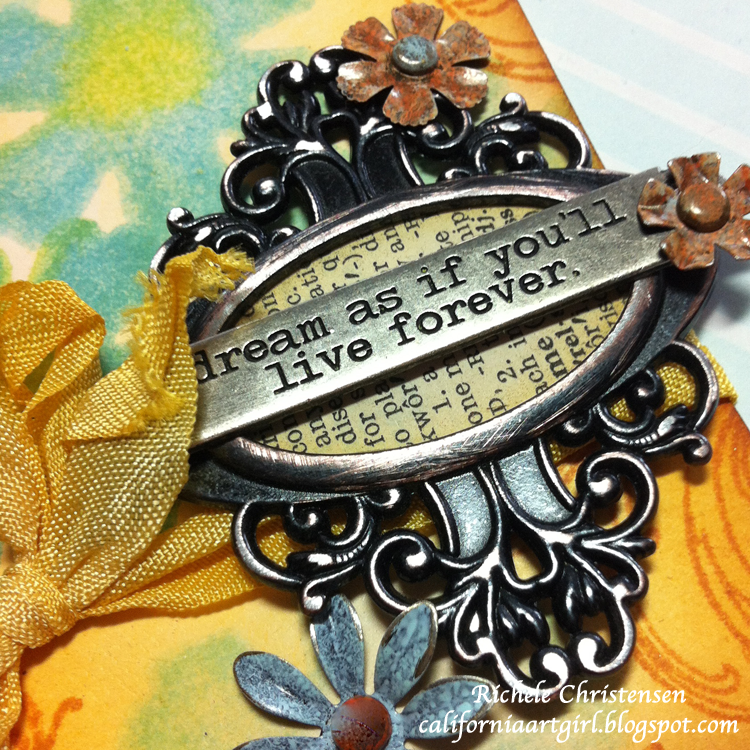 I'm on the Sizzix Design Team!! !